Scattered, medium-sized farms in landscape of medium-sized rectangular and strip fields. The character area falls within the medieval ecclesiastical parishes of Bodfari and Llandyrnog and forms part of the commote of Dogfeilyn in the ancient cantref of Dyffryn Clwyd. Rising gently and fairly uniformly from lower-lying and more poorly-drained land on banks of the river Clwyd, at a height of about 25m OD, up to better drained land on the lower western slopes of the Clwydian hills, at a height of about 110m OD. Settlement is largely represented by scattered, medium-sized farms, generally set within their own fields, though there is some modern roadside settlement on the side road near Cil Llwyn. The majority of farm buildings are relatively recent, including the 18th-century roadside rendered farmhouse with stone dressings and converted brick outbuildings (one with date of 1752) and roadside stone walling at Dhi Coch Ganol (Dre Gôch Ganol), the 18th-century cottages at Glan Clwyd Isa, the rendered 18th-century farmhouses with 19th-century brick outbuildings at Glan Clwyd Ganol and Glan Clwyd Bella, 19th-century brick farmhouses and outbuildings at Maes-siêd, Cil Llwyn, and early 20th-century brick farmhouse at Clwyd Grange with 19th-century brick and fragments of earlier stone outbuildings. The area is similar to the Llandyrnog character area to the south, but separated from it by the Plâs Ashpool parkland landscape. Medium-sized rectangular fields and some areas of strip fields running up and down or along the contours, laid out with reference to the network of roads and lanes. Some fields have recently been amalgamated. Some new hedge planting. More irregular boundaries in less well drained land on western side of area, suggesting piecemeal drainage and enclosure of low-lying meadow land. Fields defined by low-cut hawthorn hedges some of which are thick and mature and others of which are fairly thin and supplemented by post and wire fences. Some of the field boundaries are set on low banks and some on sloping ground associated with lynchets. Boundaries have been removed in places but visible as slight banks or lynchets. Scattered larger oak and ash trees along field boundaries. Scattered large rounded glacial erratics, generally along field boundaries, including one about 2.5m across near Ty'r Aer. Scattered ponds in fields on upper ground, of uncertain date and function, but probably agricultural. Occasional stone gateposts to fields on public roads. Present-day land-use is primarily pasture, with some fodder crops. Public roads tend to take a fairly straight course in slight hollow-ways along the contours, between the fields, whilst the farm tracks tend to run up and down the contours, again betweent the fields. Hedges on some of the side roads have a high proportion of holly. 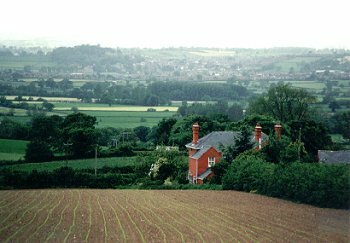 Field-names Erw'r Capel and Cae Capel near Ysgubor-ddegwm suggest the location of a missing, possibly medieval chapel known as Capel Hwlkyn, referred to by Edward Lhuyd. The place-name Ysgubor-ddegwm itself suggests an origin as a tithe barn within the parish of Bodfari. It lies close to the assumed site of a medieval chapel.